by jamesc 4/13/2019 10:48:07 AM -- NORFOLK. NE – The annual Spring Tour by the Northeast Community College Singer’s Express and Jazz Machine is about to get underway. The two groups will travel a combined 1,500 miles during the upcoming tour. 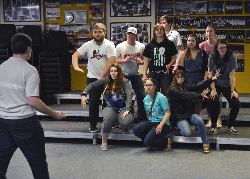 The Northeast Singers Express, an audition swing choir directed by Stewart Cramer, Northeast music instructor, will perform at 10 high schools in Nebraska and South Dakota during its annual Spring Tour. The group is accompanied by Margaret Schultz. Members of the Northeast Singers Express, listed first by hometown, include: Bee - Morgan Kavulak; Columbus - Caleb Franzen; Hartington – Emma Meisenheimer, Cecelia Ponce; Lexington – Rachel Biehl; Neligh - Megan McWhorter; Newman Grove - Kala Rast; Norfolk – Andres Hughes, Katherine Perrigan, Sheldon Wattier; Pender – Shelby Laird; Randolph – Dalton Rath; Wayne - Sydnie Neimann. The Northeast Jazz Machine, with Kevin McLouth instrumental music instructor as director, is a jazz ensemble of select students who perform concerts on campus, perform at sporting events, and tour in the spring. The Jazz Machine will perform in 12 different communities in Nebraska and South Dakota on its spring tour. The public is invited to see either the Northeast Singers Express or Jazz Machine in these free concerts at the local high schools. Members of Northeast Community College swing choir, Singers Express, rehearse with director Stewart Cramer (left) for the group’s upcoming spring tour. The Singer’s Express will visit high schools in Nebraska and South Dakota over a four-day period beginning April 22.